Bed frames. Remove mattresses and lift away box springs. Chances are there are some monster dust bunnies lurking in the spaces where box springs fit into their frames. 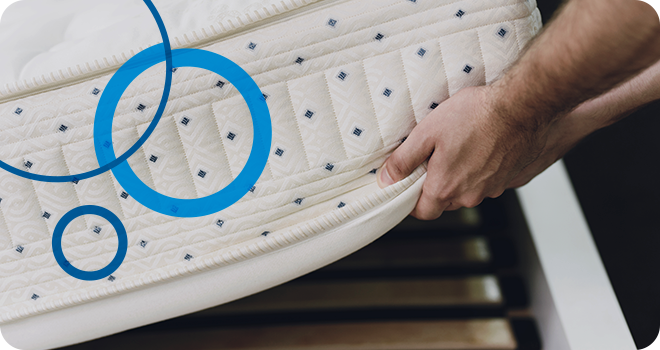 While you’re at it: rotate and (if possible) flip mattresses; launder or replace any covers designed to trap dust mites. Fireplaces/wood stoves/chimneys. The last thing you need is a chimney fire on the first night you light up a cozy, crackling blaze. It’s also vitally important to have your fireplace and furnace flues checked periodically for cracks, which can lead to carbon monoxide poisoning, so this definitely a job for the chimney professionals. While you’re at it: test and replace batteries in smoke and CO detectors. HVAC filters and vents. As these typically live in spaces you can neither see nor easily reach, it’s common to forget about replacing and/or cleaning them. Now is probably the best time of year to call in your favorite HVAC pro for routine maintenance as they’re usually in a lull time between urgent calls to fix broken A/C and home heating systems. While you’re at it: replace refrigerator air and water filters (if you’re not already in a regular habit of doing so). Dryer lint vents. Regular readers of this blog will know we mention this one at least twice a year. Untended dryer lint is a fire hazard, so get it done to keep your family and home safe. If the vent tube is really caked up with lint, replace it. And, if you haven’t done so in a while, unplug, remove the back of the machine, and vacuum away any lint collected there too. While you’re at it: pull your refrigerator out from the wall and vacuum dust collected underneath or among the cooling coils in back. Light fixtures. As the days get shorter and darker, you can maximize brightness in your home by making sure overhead light fixtures and sconces are as clean as they can be. This also gives you an opportunity to clear away summer’s collection of bug carcasses. Walls and windows. For the same reason you want to clean light fixtures at this time of year, both walls and windows need a thorough washing so they can reflect back and allow in a maximum amount of light. Both are big, messy jobs that require know-how, the right tools, and techniques—once again, this might be a job best outsourced to the professionals so you can enjoy what’s left of the best fall weather. Under the cushions. Maybe you vacuum once a week or so, but when was the last time you went under the cushions and into all the nooks and crannies of your upholstered chairs and sofas? You’ll be amazed at how much dust, crumbs, and ‘stuff you thought was lost’ has accumulated there. You might also make a few bucks in loose change!